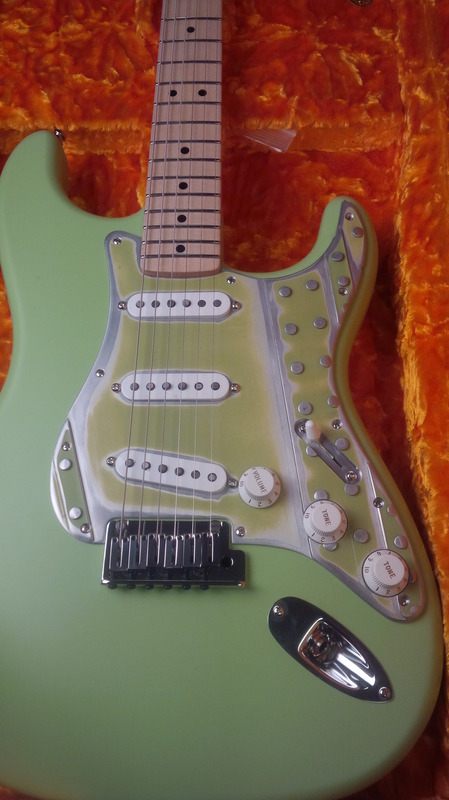 The green finish on this unique guitar is an exact Fender color match for the protective primer applied to contemporary airplanes, with a satin polyurethane top coat for protection. The contemporary design includes such features as locking tuners and a modern tremolo bridge. The neck is natural maple, and the pick guard is made from hand-selected fuselage material reclaimed from retired Boeing 747 jumbo jets. The Boeing Store is the official source for authentic merchandise from The Boeing Company. Boeing Store offers custom-designed apparel, travel accessories, collectibles, books, toys and aviation artifacts at its retail stores and e-commerce site, giving Boeing employees, customers, families and fans a chance to own a piece of the aerospace legend.